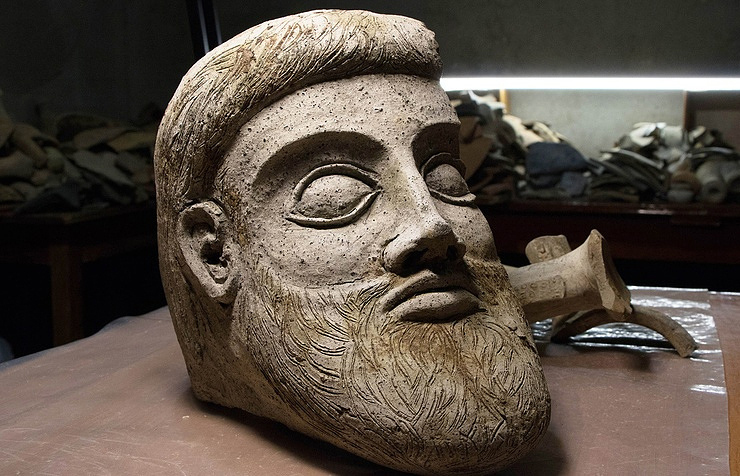 Part of a unique terracotta statue has been found during underwater surveys near the Ak-Burun Cape, in the framework of the Crimean bridge construction, announced Sergei Olkhovsky, head of the underwater unit of Russia’s Academy of Sciences. “As far as we know, this unique artifact discovery is the first of its kind in the northern Black Sea area, such objects have never been found here before. In order to figure out what it was used for, when and where it was made, we will cooperate with the leading ancient Greek art experts and will also carry out a laboratory test of the clay,” Olkhovsky said. The discovery is believed to be part of a bigger statue. Currently, two diving teams are working in the area where the terracotta find was located. They are digging manually, in order not to destroy artefacts that may be in the surrounding area. For more than 2,000 years the Ak Burun Cape served as the main shipping base on the trade route connecting the Mediterranean Sea and the Sea of Azov. As transported pots were thrown into the sea when damaged, over the years large deposits of ceramics were formed near the local pieces. Later, sediments containing fragments of pots were swept to the shallow waters of Ak-Burun Cape forming a build-up of ceramic fragments that experts have been closely examining after the construction of the Crimea Bridge had begun.